Home » Plants » With tomorrow being Floral Design Day, I thought I’d turn to Real Simple to give us some techniques and ideas on floral arranging. 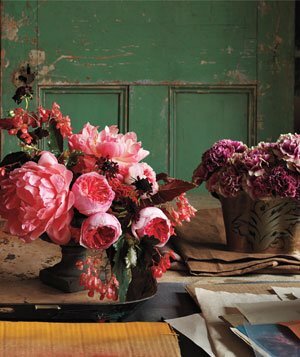 With tomorrow being Floral Design Day, I thought I’d turn to Real Simple to give us some techniques and ideas on floral arranging. With the help of Real Simple’s tips, tricks, and styling shortcuts, you’ll never have to shell out money for a store-bought bouquet ever again. 1. Create a foundation with foliage. This is the framework for the arrangement. Build a pleasing, asymmetrical shape that leans on the lip of the vase and has a high point in back. Make sure it’s not too thick, so there’s room for the flowers. 2. Add large “face” flowers, cutting stems at different lengths so some blooms nestle low and others extend. The crisscrossed foliage stems in the vase work like webbing to hold flowers where you want them. Take your time, experimenting until it looks good. 3. Weave in wispy elements, like climbing flowering vines or ferns, in three strategic spots: up high on one side, down low (spilling out of the vase), and in the middle, as if they’ve pushed their way through a cluster of larger blooms. 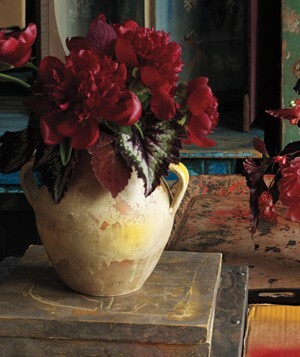 Fill a ceramic vase or jug with peonies cut at different lengths, then tuck begonia and coleus leaves around the flowers. In a widemouthed footed urn, use begonia stems (with buds) as a foundation. Separate showy peonies so they don’t overtake the display. Make a concentrated cluster of garden roses to the right. 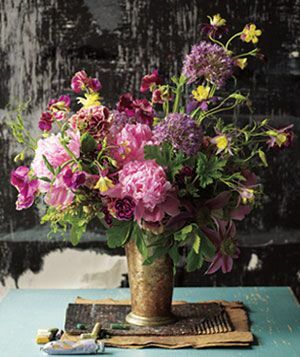 Use sculptural black-centered scabiosa as a loose divider between the roses and the peonies. Tuck in additional begonia buds and blooms to spill unevenly over the lip of the vessel. Black polyresin urn (7 inches high), $8. In a low oval container, pack a single color of variegated carnations cut at different lengths, creating a shape that’s more like a wavy landscape than a solid mound. Gloss Brown ceramic oval vase/planter (similar shape to shown), $26. Use leafy Solomon’s seal (with its little white “bells”) as a foundation, loosely filling a column-shaped vase and extending from both sides. Nestle bright, velvety cockscomb deep in the middle, just off-center, like a buried treasure. Fill holes with spearmint and poppy pods. Add tall sweet pea vines, placing them to arc toward, not away from, the arrangement. Tuck fronds of wispy maidenhair fern around the bottom on one side to spill out and down, leaving plenty of space to show its delicate shape. Sea Garden Vase.